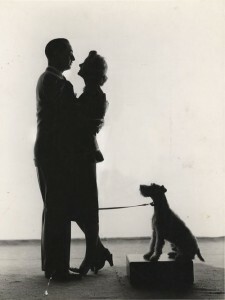 Announcing THOUGHTS ON THE THIN MAN book project! Hey. 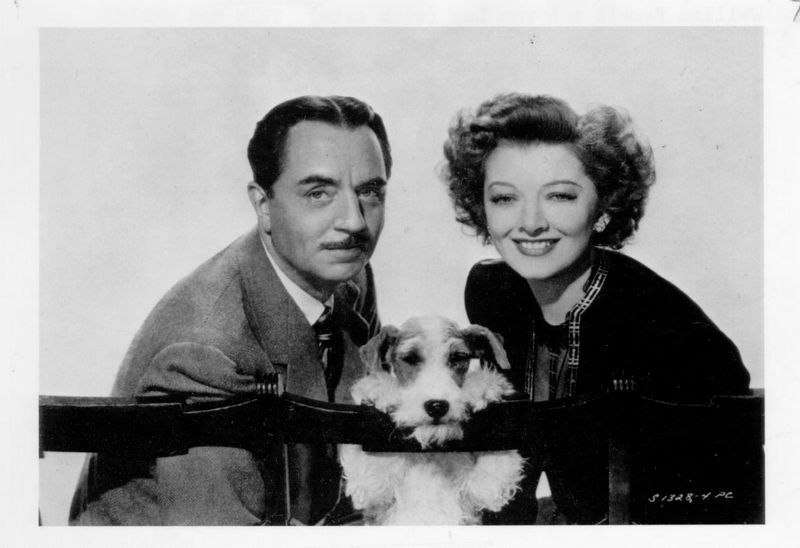 I’m putting together a book about The Thin Man series of movies. I know there are some excellent writers out there, and I need contributors! I got the idea from the Columbo fan book project I helped with. It got me to thinking: wouldn’t it be great to get some good writers writing on one of the seminal series of Golden Age Hollywood? A fan book filled with great essays and writings– and what film series deserves it better? Right now, the tentative title for the book is Thoughts on The Thin Man: Essays on the Delightful Detective Work of Nick and Nora Charles. A history of the series, its origins and evolution. Individual biographies on Woody Van Dyke, William Powell, Myrna Loy, Asta, and any other performer for whom the series is an interesting turning point. Fashions and styles of the movies as they evolved through the series. 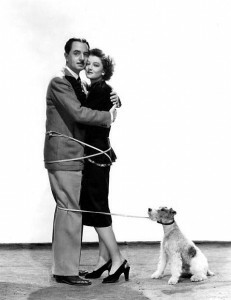 The Thin Man‘s place in movie history. Essays on each movie, their highlights and low-lights. Other Thin Man media: takes on the original novel, the radio show, the television show, etc. A deconstruction of a scene that stands out for you. What you like about the movies. What you don’t like about the movies. And anything else, really. Want to pretend you’re Zizek and take a shot at interpreting the films his way? Sure. Run the series through the Bechdel test and talk about how feminist it is (or isn’t)? Go for it. Want to send me crudely drawn pictures of Asta dressed up as a baby attached to an ominous email that just says, “you’re next”? Eh, I’ll allow it, though I can’t guarantee they’ll make it in the book. The pieces can be as long or as short as you want, but I want good writing. The main point is to get a book together that’s fun to read and in-depth, a fitting tribute to one of the more beloved movie series out there. And, again, you can buy them all from Amazon in one nice tidy box set. – Please email me your idea for an essay to precodedotcom@gmail.com or comment below. I’ll list the ideas I get in this post so that people can see what’s already been called and pick appropriately. Since this is a book, the less duplication the better. – Essays must be over 500 words and less than 3,000 words, though there can be exceptions. – Please limit the gratuitous language if at all possible (which I should hope it should be). – Please don’t plagiarize. If you use a lot of references, please either mention them in your writing (i.e. Cliff Aliperti of Immortal Ephemera noted that he thought he could beat William Powell in a wresting match but I disagree) or include some references which can be put at the end of the book. Essays should be your own original writing. Posting this the first weekend of July, I want to give everyone a reasonable amount of time to complete their writing. If you want to participate, please comment or email me by July 13th. As for essays, I’m going to put the first deadline at September 4th (two months from today). Obviously there will be a bit of wiggle room, but I would really like to get this put out and together before Christmas time. Q. Why a book and not a blogathon? A. I love blogathons as much as the next guy or gal, and while they’re great at giving you a boost in traffic, I never really get that same feeling of accomplishment that I do from creating something that physically exists. Also by forming the results into a book, the result can be more easily shared, in one, definitive place. And, hey, isn’t it nice to put something on the coffee table that you had a hand in? Or, if it turns out alright, something you can share with friends? Q. What happens if you receive too many entries? A. Honestly, I’ll believe it when I see it. There will always be a level of hemorrhaging between signups and the due date– some people just don’t have the time or find themselves having too many commitments to participate. If, miraculously, it does occur and the book appears like it will be unwieldy, I will work with participants to split the entries into separate books, with one being released shortly after the other. Q. Can I submit something I’ve already written? Or can I write something, post it to my blog, and then send it in? A. I’ll allow previous writing, though it will still be edited or I may make suggestions about (possibly) improving it. No matter what, you retain the rights to your work. The only thing I do ask is that if you write your essay specifically for the book, if you would please refrain from posting it on your own blog until the book is published and you can use the occasion to link to the finished product. Or, if you want to keep your writing exclusive to the book, that’d be great too! Q. Can I submit more than one piece of writing? Q. How will the book be published? I’m going to plan on using Lulu right now, but we’ll see what happens. There will be a physical copy and a digital copy of the finished work, and they should be available in most online bookstores. Q. What will the cover be? Q. How will the book be organized? Q. Can I submit my Twilight fanfiction for this only replacing Bella and Edward for Nick and Nora and making Jasper Asta? A. I’m sorry, you and your cash cow should probably talk to a real publisher. The tentative list of participants has been moved to this update post. Please go here to read more on this project! Danny, this sounds fascinating and you know I’m in, especially since you (and William Powell) have called me out. I’d like to contribute a reworked version of my Edward Ellis (Wynant) biography. I don’t want to spam you with the link here, but I’ll send via Twitter. Thanks! Sounds great, Cliff! Looking forward to it! Awesome, Tars! I’d love to have you on board! That’s perfect! It may need a bit of retooling– YouTube links, unfortunately, don’t carry over well into book format– but this would be a perfect addition. I can edit it as is for the book, or, if you have any changes you want to make, let me know! I’ll go ahead and retool it, then – I thought it would be a good idea if you had a look at it before I plunged in. Oh, Danny, you can’t imagine hoe happy you made me! I’d like to write a profile for Myrna Loy. She is just brilliant. Oh, and for the record, my real, full name is Letícia Magalhães. That’s a lovely name, Le! And I’m glad you’re going to take on Myrna– seems like a perfect fit! This is a fantastic idea! If I could submit something along the lines of my first impression of The Thin Man (1934), then count me in! I still remember what it felt like sitting down to watch that film for the first time and would love to tell you all about it. Let me know if you’re cool with that and I’ll start working on it right away. Bear in mind my writing style; casual, humorous and a little bit naughty at times. Is that cool? Or would you like me to adopt a more professional tone for the book? Brash, humorous and a bit naughty sounds perfect. The book is a collection of both facts and fun, and I think getting people to share their memories of the series is a must! Can’t wait to see what you’ve got! Great! Will try and get started this week! Can I do the bio on W.S. Van Dyke? Karen, this is among my greatest fantasies come true. Thank you! That’d be great!